Kalank is being directed by Abhishek Varman and stars Aditya Roy Kapoor, Madhuri Dixit, Alia Bhatt and Sanjay Dutt in the pivotal roles. 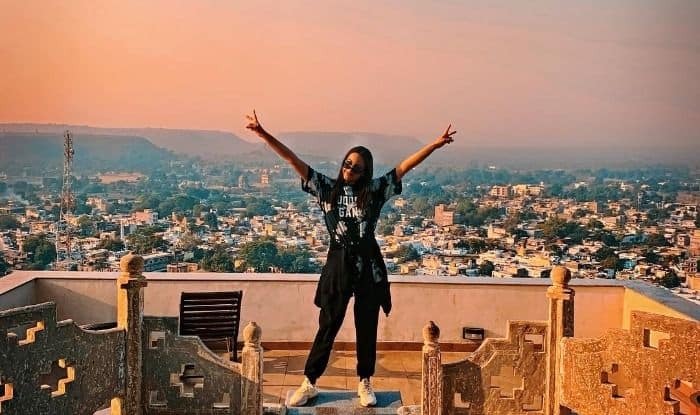 Having wrapped up shooting for her upcoming multi-starrer Kalank, actress Sonakshi Sinha posted a picture on her social media account in which she is seen posing victory signs on top of a terrace in Chanderi. Donning an all-black casual look, against the rosy sunrise lighting up Chanderi in vibrant hues, Sonakshi and the frame altogether, looks nothing short of spectacular. Expressing her proudness in being part of the project, the Dabangg actress shared the picture on her Instagram handle and captioned it, “Just the beginning of the year, and the end of a new film! Its a wrap for me on ‘Kalank’… a project I am proud to be a part of! Cant wait for you all to see it. On top of the world” (sic). Kalank is being directed by Abhishek Varman and stars Aditya Roy Kapoor, Madhuri Dixit, Alia Bhatt and Sanjay Dutt in the pivotal roles. Produced by Karan Johar, Sajid Nadiadwala and Fox Star Studios, Kalank is slated to release on April 19, 2019. Earlier, Sonakshi was seen grinding in the gym after a self-claimed month off from her workout regime. Her Instagram upload showed the actress sweating out December calories and we were bowled over with her hotness during the workout sessions. In the video that she shared, Sona could be seen flaunting her workout poses, donning a casual white tee, paired with black activewear and hair swept back in a neat ponytail while her trainer, Namrata Purohit, supervised her grind.